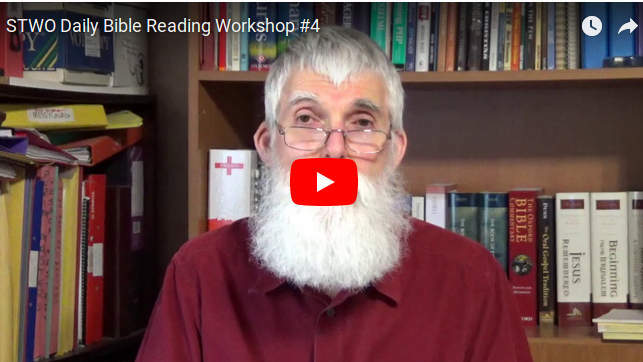 We've just released the fourth and final part of Spreading The Word - Online's Daily Bible Reading Worshop today. This is the last of four short video sessions over a ten day period, with plenty of opportunity to comment and engage here and on social media. We'd be honoured to have you join us by watching the fourth video (click the image above) and then leave some comments below to let us know what you think. If you missed the earlier parts, just click on the Workshop Started" or "Workshop Session 2 (or 3) Released" article in the left-hand column and then come back for this one. How much is the subscription cost in American dollars? I'm quite excited about this project. I have been believer in Yeshua since 1971. I am 73 years of age. My approach to the scripture has always been to study the word rather than just reading. My favorite bible teacher is Derek Prince, now received into eternity. His analytic approach to the scriptures always appealed to me. He was well educated at Eaton College (entered at 14 yrs of age) and Cambridge , trained in logic(pre conversion era) and very good in languages being qualified to teach greek at university level. I would like to say your teaching methods came out quite positively in the first three presentations and I am very excited to see what the future holds. I welcome this opportunity to join this on line community. I recently purchased a John MacArthur study Bible, in the hope of deepening my knowledge of the scriptures, but, as you have rightly observed about lifestyles, my issue is centred on discipline to study daily. It sounds , from these 4 workshops, as if this daily study is a virtual college, where I can drop into expanding seminars and libraries along the way. Add to this, no travel cost or delays on the way. Yes, include me as a student.